Welcome to Reuters' live coverage of events in Japan, where the biggest earthquake to hit the country in 140 years has struck the northern coast, triggering a 10-metre tsunami that swept away everything in its path, including houses, cars and even buildings. - The biggest earthquake to hit Japan in 140 years struck the northeast coast on Friday, triggering a 10-metre tsunami that swept away everything in its path, including houses, cars and farm buildings on fire. - The earthquake struck at 1446 local time (0546 GMT). - 22 people are confirmed dead, with many more missing. Some news agencies are reporting a higher number of fatalities. - The Philippines, Taiwan and Indonesia all issued tsunami alerts, reviving memories of the giant tsunami which struck Asia in 2004. The Pacific Tsunami Warning Centre issued alerts for countries to the west and across the Pacific as far away as Colombia and Peru. - There were several strong aftershocks. In Tokyo, buildings shook violently. An oil refinery near the city was on fire, with dozens of storage tanks under threat. - Stunning TV footage showed the tsunami carrying the debris and fires across a large swathe of coastal farmland near the city of Sendai, which has a population of one million. The pictures suggested the death toll was going to rise. - Sendai is 300 km (180 miles) northeast of Tokyo and the epicentre at sea was not far away. - Thick smoke was also pouring out of an industrial area in Yokohama's Isogo area. TV footage showed boats, cars and trucks floating in water after a small tsunami hit the town of Kamaichi in northern Japan. An overpass, location unknown, appeared to have collapsed into the water. - UK airlines have cancelled flights to Tokyo. - The western prefecture of Wakayama ordered 20,000 people to evacuate after further tsunami warnings. - Passengers on a subway line in Tokyo screamed and grabbed other passengers' hands during the quake. 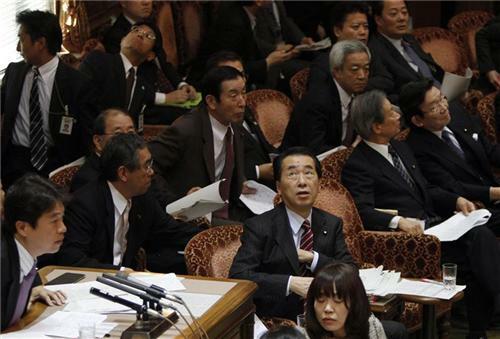 The shaking was so bad it was hard to stand, said Reuters reporter Mariko Katsumura. Even in a nation accustomed to tremors, the massive earthquake and the tsunami it triggered have been terrifyingly different, writes Chisa Fujioka. The countries for which a tsunami warning is in effect now includes: Russia, Taiwan, the Philippines, Indonesia, Papua New Guinea, Australia, New Zealand, Fiji, Mexico, Guatemala, El Salvador, Costa Rica, Nicaragua, Panama, Honduras, Chile, Ecuador, Colombia and Peru. Some regions could be hit by waves within an hour, while for others it could be many hours. The Red Cross in Geneva has said the wall of water was higher than some Pacific Islands. Hidekatsu Hata, manager of a noodle restaurant in Tokyo's Akasaka area, told Reuters of the moment the earthquake struck. "I was terrified and I'm still frightened," he said, "I've never experienced such a big quake before." 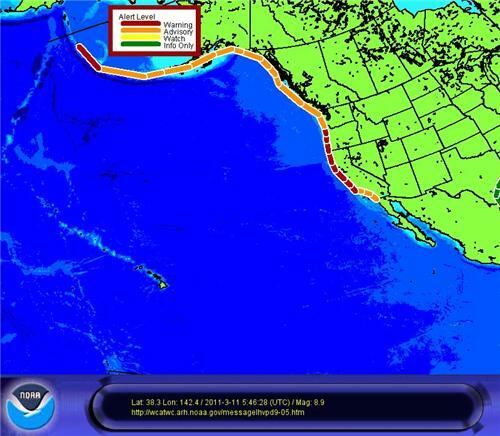 The West Coast and Alaska Tsunami Warning Center has issued a warning for: the coastal areas of California and Oregon from Point Concepcion, California to the Oregon-Washington border; the coastal areas of Alaska from Amchitka Pass, Alaska (125 miles W of Adak) to Attu, Alaska; the coastal areas of California from the California-Mexico border to Point Concepcion, California; and the coastal areas of Washington, British Columbia and Alaska from the Oregon-Washington border to Amchitka Pass, Alaska (125 miles W of Adak). Some amateur footage reportedly captured in Sendai when the earthquake struck. Dr Roger Musson from British Geological Survey tells BBC News the Japan earthquake is the sixth largest ever recorded. Apologies, the amateur video we posted earlier purporting to show the Japan earthquake was actually shot in Christchurch. Thanks @gary for pointing that out. i have family in fukuoka japan. does anyone know the extent of the damage in that region? Family of a work colleague told me that an aftershock hit Japan(Tokyo). Steve, fukuoka appears to be distant from the area that experienced main damage. According to a news report by channelnewsasia.com, "The carrier says, flight SQ12 which took off from Singapore at about 9.45am, will be diverted to Fukuoka in southern Japan instead. " So I'm assuming they are alright if flights are being diverted to there. I'm in Tokyo, in the last hour there's been a few aftershocks every 10-15 mins or so. In that interview with BBC News, Dr Roger Musson, British Geological Survey, went on to say that the Japan earthquake was much bigger than the quake which struck Christchurch in New Zealand in February. The reason the Christchurch quake was so destructive, he said, was due to it being a direct hit on the city. thank you for all the info. this is so tragic. watching these videos is just crazy. i just hope the u.s. doesnt see damage to that extent. 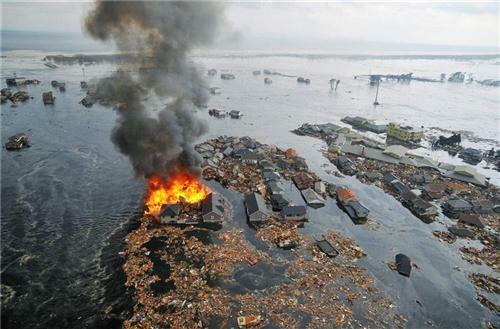 One of the tragic day for economically devastated Japan. May GOD bless all. Need to give serious thoughts on man made damages triggering to natural damages. The US will be fine! The rest of asia is in way more danger. steve, not at all. SC will be fine. 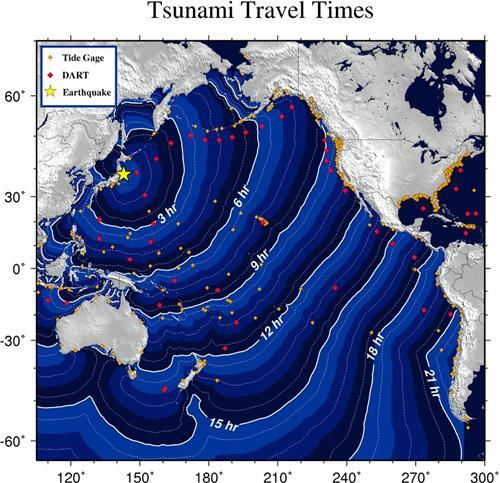 West coast will see effects, if any, of tsunami. Any word about the Misawa Air Base in Northern Japan? just spoke to a colleague in Tokyo, things are fine there but the subway system is down.